For the surname, see Beretta (surname). For the automobile, see Chevrolet Beretta. For other uses, see Beretta (disambiguation). Fabbrica d'Armi Pietro Beretta (Italian pronunciation: [ˈfabbrika ˈdarmi ˈpjɛːtro beˈretta]; "Pietro Beretta Gun Factory") is a privately held Italian firearms manufacturing company operating in several countries. Its firearms are used worldwide for a variety of civilian, law enforcement, and military purposes. Sporting arms account for three-quarters of sales; Beretta is also known for marketing shooting clothes and accessories. Founded in the 16th century, Beretta is the oldest active manufacturer of firearm components in the world. In 1526 its inaugural product was arquebus barrels; by all accounts Beretta-made barrels equipped the Venetian fleet at the Battle of Lepanto in 1571. Beretta has supplied weapons for every major European war since 1650. 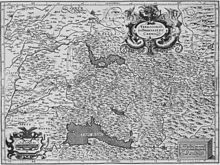 16th Century map by Giovanni Antonio Magini of the Province of Brescia. Val Trompia is in the center. Map is oriented with West at the top. Val Trompia, a northern Italian river valley in the Province of Brescia, Lombardy, has been mined for iron ore since the time of the Roman Empire. In the Middle Ages, Val Trompia was known for its ironworks; after the Renaissance it came to be a center for the manufacture of weapons. By the mid 16th century Val Trompia had forty ironworks, supplied by fifty mines and eight smelters. The birthplace of Beretta is in the village of Gardone located on the banks of the Mella river, in the middle of Val Trompia (i.e., between the upper valley and lower valley). The Beretta forge was in operation from about 1500, although the first documented transaction is a contract dated October 3, 1526 for 185 arquebus barrels, for which the Republic of Venice was to pay 296 ducats to Maestro di Canne (master gun-barrel maker) Bartolomeo Beretta (in Italian). 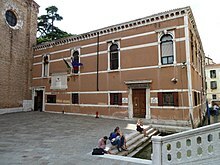 The original account document for the order of those barrels is now stored in the Archivio di Stato di Venezia (in Italian) in Venice. By the end of the 17th century, Beretta had become the second largest gun barrel maker in Gardone. Under the guild system, the knowledge of gun barrel fabrication that was bequeathed to Jacopo (1520/25 – …) from his father Bartolomeo (1490 – 1565/68) was then passed on to his own son Giovannino (1550 – post 1577), and to his grandson Giovan Antonio (1577 – post 1649) and so on until guilds were abolished by Napoleon after his conquest of Venetian Republic in 1797. Beretta has been owned by the same family for almost five hundred years and is a founding member of Les Henokiens, an association of bicentenary companies that are family owned and operated. In 1918, the Beretta Model 1918, one of the first submachine guns in the world, was fielded by the Italian army. Beretta manufactured rifles and pistols for the Italian military until the 1943 Armistice between Italy and the Allied forces during World War II. With the Wehrmacht's control of northern Italy, the Germans seized Beretta and continued producing arms until the 1945 German surrender in Italy. In that time, the quality of the exterior finish of the weapons diminished and was much more inferior to both the pre-war and mid-war weapons, but their operation remained excellent. The last shipment of Type I Rifles left Venice for Japan in a U-boat in 1942. In the 1980s, Beretta enjoyed a renewal of popularity in North America after its Beretta 92 pistol was selected as the service handgun for the United States Army under the designation of "M9 pistol". In the 1970s, Beretta also started a manufacturing plant in São Paulo, Brazil. A contract between Beretta and the Brazilian government was signed, under which Beretta produced Beretta 92s for the Brazilian Army until 1980. Later this plant was sold to Taurus, who continues to manufacture the Beretta 92 under the name of PT92 using the same tools and labour which Beretta used, without the need for a license from Beretta, since the design is based on the original Beretta 92, for which the patents are expired. Beretta acquired several domestic competitors (notably Benelli and Franchi) and some foreign companies (notably in Finland) in the late 1980s. Today, Fabbrica d'Armi Pietro Beretta (Beretta S.p.A) is run by Franco Gussalli Beretta, President and CEO. The traditional father-to-son Beretta dynasty was interrupted when Ugo Gussalli Beretta assumed the firm's control; uncles Carlo and Giuseppe Beretta were childless; Ugo married into the Beretta family and adopted the last name Beretta. His sons are now direct descendants through their mother's side of the family. Beretta is known for its broad range of firearms: side-by-side shotguns, over-and-under shotguns, hunting rifles, express rifles, assault rifles, submachine guns, lever- and bolt-action rifles, single- and double-action revolvers and semi-automatic pistols. The parent company, Beretta Holding, also owns Beretta USA, Benelli, Franchi, SAKO, Stoeger, Tikka, Uberti, and the Burris Optics company. The model Beretta 92FS was the primary side arm of the United States Army, Marine Corps, Navy and Air Force, designated the M9 pistol. In 1985, Beretta was chosen after a controversial competition to produce the M9, winning a contract for 500,000 pistols. A condition of the original agreement was domestic fabrication of the M9. After complaints from servicemen, the Beretta M9 lost the U.S. Army sidearm contract in January 2017 to the 9mm version of the SIG Sauer P320. ^ a b c d Grant, Tina (8 June 2001). International directory of company histories. Detroit, Mich: St. James Press. ISBN 9781558624443 – via FundingUniverse. ^ "FABBRICA D'ARMI PIETRO BERETTA S.p.A. Today". Fabbrica d'Armi Pietro Beretta. Retrieved 1 September 2015. Passed down through 15 generations of the Beretta family, the company was already active in Gardone Valtrompia in the 1400s and its work has been documented since 1526. ^ Thomson, Candus (30 March 2001). "Same aim, for nearly 500 years". The Baltimore Sun. Tribune Publishing Company. Retrieved 28 August 2015. ^ "Press Room : Gallery". Les Hénokiens - Association internationale d'entreprises familiales au moins bicentenaires. Retrieved 2 September 2015. ^ "Beretta International". Beretta.com. Retrieved 2008-09-08. ^ "Beretta's BM59: The Ultimate Garand" (PDF). Archived from the original (PDF) on March 25, 2009. Retrieved February 7, 2016. ^ "Beretta BM 59 Semi Automatic Rifle". National Firearms Museum. NRA. Retrieved 27 August 2015. ^ McClellan, Angus (12 November 2009). "The Beretta M9: 25 Years of Service". American Rifleman. NRA. Retrieved 30 August 2015. ^ Humphries, Michael (27 February 2012). "Taurus PT 92". Shooting Illustrated. NRA. Retrieved 29 August 2015. Although that first pistol would look very different to anyone familiar with the current PT 92, it was quite similar in appearance to the existent Beretta Model 92. ^ "Switching targets". The Economist. 16 November 2006. Retrieved 27 August 2015. Beretta has reinvented itself in the past decade, a change as dramatic as the reinvention of its most famous customer in 'Casino Royale', the latest Bond film. ^ Roberts, Hannah (2016-06-09). "Franco Gussalli Beretta defends the family-run gunmaking company". Financial Times. Retrieved 2019-04-15. ^ "Beretta Announces Limited Edition 92 Centennial Pistol". American Rifleman. NRA. 28 May 2015. Retrieved 30 August 2015. The original Beretta Model 1915 was adopted by the Italian forces one month after Italy entered World War I. ^ "Beretta and the M9A3: Update". American Rifleman. NRA. 3 February 2015. Retrieved 30 August 2015. …Beretta submitted an Engineering Change Proposal (ECP) to its current contract the company calls the M9A3, which fulfilled many of the requirements set out for the looming Modular Handgun project. ^ "U.S. Army Acquires Additional Beretta M9 9mm Pistols". Shooting Illustrated. NRA. 29 July 2014. Retrieved 29 August 2015. To date, Beretta has delivered over 600,000 M9 pistols, with 18,000 already scheduled for delivery under the new 5 year contract. ^ "Italian designed, American made, Iraq deployed". American Machinist. Penton. 13 Dec 2005. Retrieved 27 August 2005. Its pistols have been used in every major U.S. military engagement since the late 1980s, including both Iraq campaigns, in Bosnia, Panama and Afghanistan. ^ Valsecchi, Piero (10 March 1985). "Italy-Based Beretta Has Made Weapons Since 1526 : Army Opts for James Bond's Handgun". Los Angeles Times. Associated Press. Retrieved 27 August 2015. Beretta will begin production of the model for the U.S. military in its ancient factory in this northern region that has been the stronghold of Italy's arms industry since Roman slaves began working on metals and arms. ^ Kennedy, Harold (October 2000). "Beretta 9 mm Finds Niche In 'Low-Intensity' Missions". National Defense. NDIA. Retrieved 28 August 2015. ^ Mizokami, Kyle (23 January 2017). "The Sig P320 is the U.S. Army's New Sidearm". Yahoo News. Retrieved 28 January 2017. After a two-year, $17 million dollar search involving 12 contestants, the U.S. Army has finally picked its first new handgun in 32 years. Wilson, R. L. (2000). The world of Beretta : an international legend. New York: Random House. ISBN 9780375501494.